This Crowfield point was found sometime before 1956 by Waldo Stanford near the town of Busti in Chautauqua County, New York on the bank of Stillwater Creek. He said "I found the blade where the sod had slid a few inches. It was sticking out of some loose soil between the loose sod and the top of the bank." The type-site for Crowfield points is located near the town of London at the southern tip of Ontario, Canada. Excavation at this site in the early 1980’s produced 30 fluted bifaces along with over 170 other tools, blanks and preforms in association with a large pit. All these items had been exposed to intense heat. 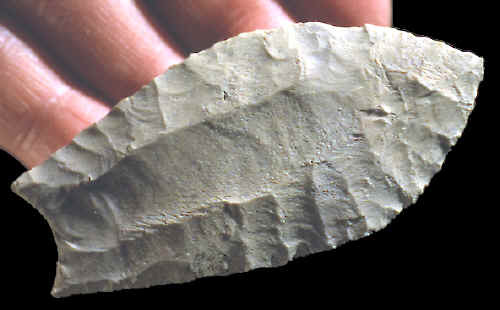 Crowfield points are considered to be possibly the latest fluted point form to be found in the northeast. They have been reported from Michigan, Ohio, Pennsylvania, New York, Vermont and Ontario. An estimated date for this point type may be somewhere around 10,700 years ago. This Crowfield point is very thin and skillfully made. It measures 2 7/8 inches (7.2 cm) long and is made of light gray Onondaga chert. This point was illustrated by William A. Richie in the 1957 edition of "Traces of Early Man in the Northeast", New York State Museum Bulletin Number 358. 1984, "Archaeology of Eastern North America," Crowfield: A Preliminary Report on A Probable Paleo-Indian Cremation In Southwestern Ontario, by D. Brian Deller & C.J. Ellis, pp. 41-71. 1991, "Selected Preforms, Points, and Knives of the North American Indians, Vol. 2," Crowfield, by Greg Perino, p.60.